Working for the National Trust has many great benefits, one of the main being you are a part of a national organisation and you have colleagues in loads of interesting and beautiful places, including over in Northern Ireland (which can be easy to forget...sorry NI). As such Rangers across the Trust have the opportunity (thanks to the generosity of the Mayled family, in memory of Andy Mayled), to link up with other Rangers allowing them to learn, discover and experience somewhere new. So what greater contrast than the high fells of the Lakes to the hustle and bustle of Northern Ireland's capital Belfast! Why Belfast I hear you ask?! Well, I've done a wee bit of traveling, but hadn't yet made it to any part of Ireland, so when I heard about the Ranger link, heading over to Belfast seem a good way to kill two birds with one stone. It also helped that I knew the Ranger, Craig, from the work I do as a rep with Prospect, the NT's union. As such it wasn't long before we had dates in the diary, ferries booked and I was getting excited to be somewhere new and completely different. Only as it turned out it was different...yet the same! Same old fencing job, different location! Let me explain. You see, although the South Lakes has a 13 strong Ranger team, that team is broken down into more specialist teams and day to day I mainly work with the 3 other guys that make up the Upland team. So rocking up to the Ranger office at Minnowburn and meeting Colin, Mick and Craig felt like a temporary exchange of the usual faces. Accompanying them was a friendly bustle of volunteers, and lets not forget Bella! Over the 3 days I got to see some of the main bits of work the guys get up to in Belfast. From working with school groups pond dipping and in the forest school, to practical work on one of their coastal sites in Port Muck, to the intricacy of project planning a car park development at Minnowburn where they can annually receive over 150,000 visitors. It's what we as Rangers would expect to be involved in, it's just the balance of jobs or the habitats that may be slightly different. A very Ranger suitable totem pole, all about cake! For example in Belfast the large majority of their volunteer input is from large groups, whether those are corporate groups wanting to get out and do something different, or school groups looking to have a mix of education and conservation. Partnership working is also key, Minnowburn itself is only 120 acres within the much larger Lagan Valley, covering 3500 acres in total and welcoming between 2-3million visitors a year. Being on the doorstep to a population of over 300,000 people living in Belfast the opportunities to work with communities are well taken, a great example being the community garden that sits just behind the Ranger office and comes complete with a wood fired pizza oven for those long summer evenings! All in all it was a really interesting week that I would recommend to all Rangers. It makes a refreshing change for both sides of the link and allows for plenty of learning, even if to start with you don't know how to articulate what that learning is! For me though its back to the grind stone and back to home sweet home. Home...literally- i can see my house! Remember those long summer days during the BIG 6 week holidays which seemed to go on FOREVER (well perhaps it did to our parents…)… When the weather was great and there was fun to be found around every corner? The rangers absolutely love building dens! Who says you have to grow up? 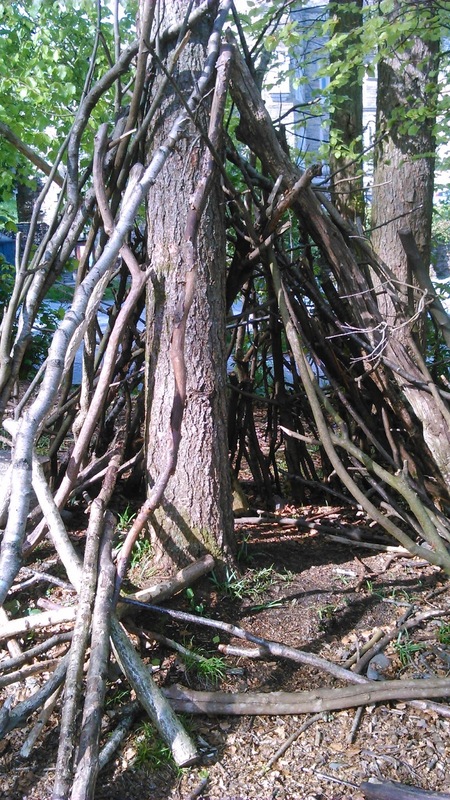 Dens don’t always have to be your traditional sticks propped up against a main stem. 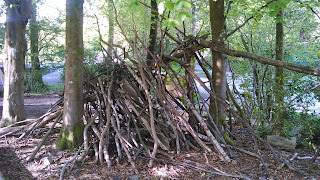 I recently learnt about the concept of ‘made versus invade’ dens – this is the idea that dens can be ‘made’ from scratch using the more traditional materials such as twigs, sticks and leaves (like in the photo above) or they can be ‘invaded’ such as finding little nooks and crannys that might not otherwise be seen as so. Try finding a hollowed out tree, putting a sheet over an A-frame picnic bench or behind the sofa when the weather is too wet out! Do you remember that feeling of excitement as you inadvertently lose your whole day to developing and perfecting your own hideaway? The best news is, you can come build the biggest, the best, the most complex dens at Wray Castle anytime as part of the National Trusts’ 50 Things to do before you are 11 and 3/4. 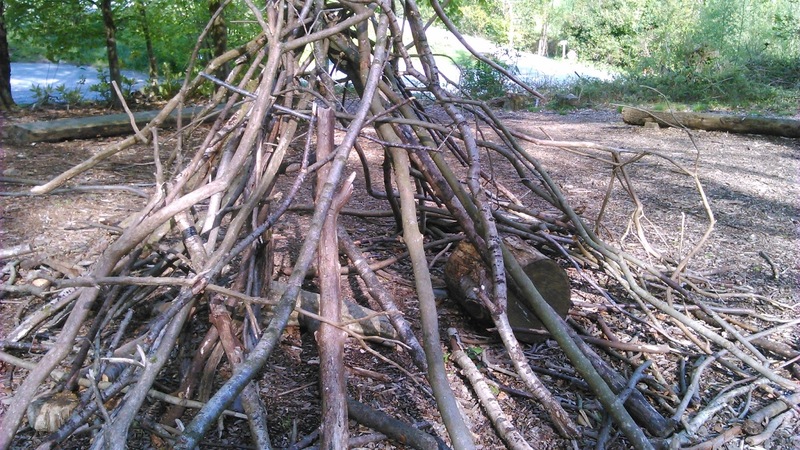 Why not see how small you can build your den (for your favourite toy or an ant?) or see how many rooms you can build within your den. Calling all Dads - this is your time to shine! We often find that parents, Dads in particular, and older siblings are the real den building aficionados. Keen to step up and show the younger members of the family how dens are really built; even without being invited to! So we are putting on a day aimed especially at the big kids! Come down to Wray Castle on Father’s Day for ‘Dens for Dads’ – The rangers are busy gathering plenty of fresh den building material behind the scenes to really get you into the competitive spirit… What will you come up with? On the 21st June from 10-5pm; normal admission applies but the event is free. Check out the Wray Castle Facebook Page for more information or call 015394 33250. The best thing about den building is making it up, the possibilities are endless… but just in case you wanted some inspiration to get you started, here are some top tips! The ultimate classic 'tipi' - It takes quite some skill and balance to construct this type of den with no middle support. Can you manage it without using rope? 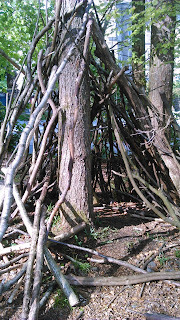 The 'bivi' den - made by balancing a long main stem between two v-shaped branches or nobbles in a tree. The walls are then made by balancing twigs up and down the length of the main stem. There is also the 'whatever you have lying around den' - never underestimate the value of sofas, clothing racks, cushions and duvets in the living room! 2) All dens need walls – so you have decided on your basic structure, what about adding some walls? If your den is in the woods, you can add moss, leaves or brash (or perhaps some old sheets if it is not raining) to make it water tight and more secretive! All dens need walls - the material from a branch that fell from the Blue Atlas Cedar in the Wray Castle grounds makes great wall material! 3) All dens need a floor – if you are building your den in the woods, perhaps you can find some leaves to carpet your floor. Beware using of bracken though, you don’t want to get tics! 4) Your hide-out needs some furniture… hunt around for logs and branches that will make your den fit for a king! 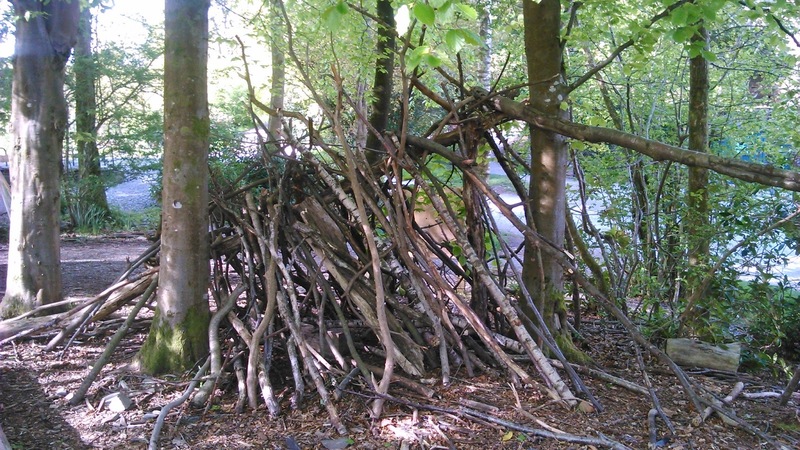 5) Where can you go to build your ultimate den?There are lots of great places to go build dens - local woodlands and parks, National Trust properties such as Wray Castle, Allan Bank and Sizergh, local parks, your back garden (ask your parents if you can sleep out?! ), your front room? 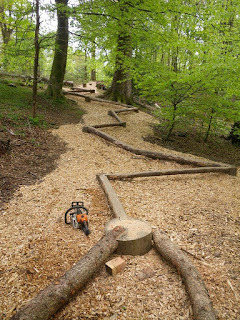 Building the ultimate den in the Wray Castle Play Trail..
You may have read my previous blogs about the play trail describing the new developments in the past few months. Or perhaps you have seen rangers and volunteers busy hard at work constructing more balance beams, log stilts and a giant spiders’ web… if you haven’t been down this year yet, come on down!! Testing your balancing skills on the new balance beams? 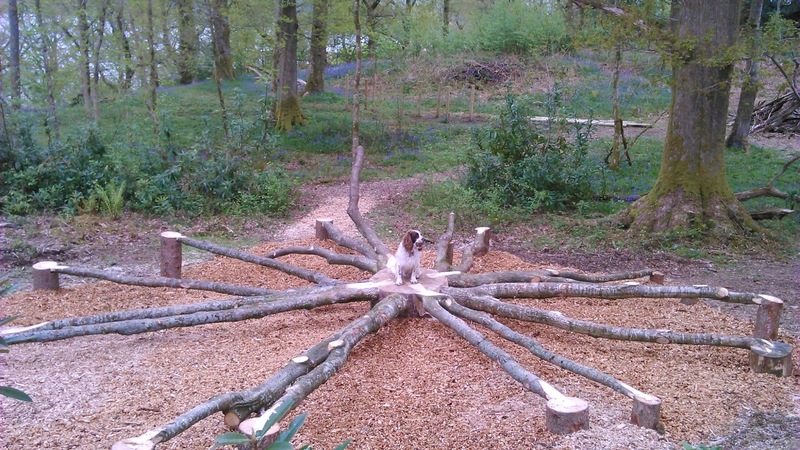 Jed, the dog, modeling the new spiders' web! 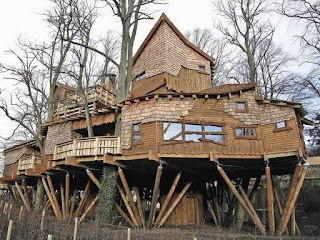 We have an even bigger plan for this year - to build the ultimate hide-out den, A TREEHOUSE!! And we want your help to design it… come visit the castle and draw or build your perfect treehouse in the craft room – or if you can't come to the castle, why not send us a photo to the Wray Castle Facebook Page? Get thinking and designing and the rangers will combine the best ones to build the treehouse in the play trail this summer! We can’t wait to see your ideas! Rangers are fairly accustomed to strange requests, and we pride ourselves on our can-do attitude - but it still came as something of a shock when we were asked, ‘Can we do a high speed car crash in Tilberthwaite?’ This isn’t the only unusual one we’ve had over the past eighteen months – there’s also been ‘Can we take plaster casts of the quarry walls?’ ‘Can we build an enormous waterslide that chucks people into Tarn Hows?’ and ‘Can we zoom a huge drone above your woods?’ Contrary to what you might expect, we only said no to one of these requests (guess which one! ), and they all came from one group of people – film-makers. With such a spectacular and characterful patch, it’s perhaps no surprise that lots of people making film and TV want to shoot here, and you can spot South Lakes in big budget feature films like Miss Potter and Snow White and the Huntsman, TV dramas like Safe House, the opening credits of Countryfile, and even a toilet paper advert! This summer we’re busy working with a film company making a new adaptation of Swallows and Amazons, another TV drama, and lots of smaller documentaries. Sometimes it’s almost a full time job. So why do we do it? The simple answer is that, as a charity, the money the film makers pay is absolutely essential to the National Trust, and allows us to do even more of our important conservation work. Every day film-makers spend using our land and buildings pays for woodland management, watercourse protection, visitor access routes, and all the other work we do to protect and look after South Lakes ‘forever, for everyone’. Filming is also a really important source of income for the Trust on a national scale – find out more here. These films also create great publicity - sometimes globally - and attract more visitors to experience our inspirational places. We work closely with our tenant farmers and the films' location managers to ensure that nothing the film units do damages the land or buildings – sometimes this means placing restrictions on where they can work, or asking that they lay temporary tracks before driving vehicles across fields. For Swallows and Amazons, the crew will have to leave their trucks at the road and carry their gear by hand into woodlands, in order to protect and preserve these special places. We usually supervise filming to ensure all the conditions are being met, sometimes long into the night, and places are often left better than when filming began because of repairs to walls or improvements to farm infrastructure. And naturally, we’re not afraid to say no to those requests that we think are going to cause damage or degradation, or are otherwise inappropriate. So if you haven’t guessed already, the one we refused recently was the giant waterslide at Tarn Hows – although it did look like fun!